When you get a puppy, it naturally grabs your shoes and other belongings and begins chewing these items. Humans do the same thing when they teethe as babies. However, for dogs this habit may continue beyond their formative years. Chewing helps the teething pain, but dogs do not learn that this habit is bad once they stop teething. They may do it out of boredom or from separation anxiety. If your pet has separation anxiety, be cautious with how your handle the situation. 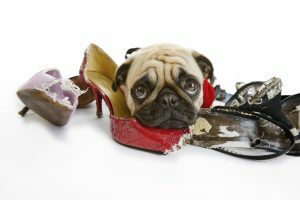 Dogs who chew on shoes for this reason do so to relieve stress. If this is the case, contact your vet to resolve this issue before addressing the chewing problem. If your pet is simply bored, make sure they receive enough exercise each day. This is a simple fix because your dog will be too tired from the exercise during their alone time. In addition, puppy proof your house. To avoid items like shoes, shoelaces and wires being chewed to pieces, simply remove the objects from view or reach of your pet. This will force your dog to only chew on designated toys through removing the temptation. If these methods do not work, use a spray bottle when your dog chews on the object to correct the behavior. This way, they will learn quickly that the behavior is not ok. The water doesn’t hurt the pet, but the message come across clearly. Give your dog a designated chew toy so that it knows that behavior on a specific toy is allowed. Remember to be gentle and have patience with this endeavor. Breaking habits is difficult for anyone.